It was a sailor's dream: more than 100 bars, casinos and whorehouses, just a short boat ride across the Napa River that separated the sprawling Mare Island Naval Shipyard from Vallejo, California. Why bother to head for San Francisco, about 25 miles to the south, when you could raise hell in Vallejo's Lower Georgia Street district? This was the city's original business zone, but over time the grocery stores, clothing shops and offices for doctors and lawyers were replaced by brightly lit joints that appealed to the sailors. Every time the United States got involved in wars, there were dramatic expansions in shipyard construction and repair. That meant big business for Lower Georgia Street as sailors on liberty poured into town. Top Navy brass made repeated demands on the city to clean up the problems. The district would improve, but only temporarily. In Vallejo, nothing before or since was as wild as the Lower Georgia district during World War II. 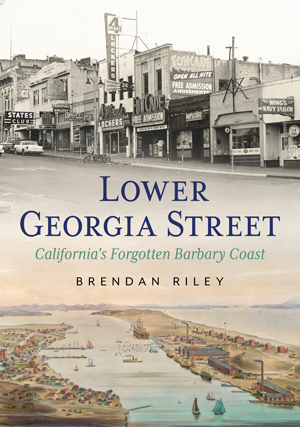 BRENDAN RILEY grew up in the Navy town of Vallejo, California, earned a degree in English literature from St. Mary's College in Moraga, California, and then spent two years as a sailor aboard a Navy ammunition ship during the Vietnam War. He had a 39-year career as a political and government affairs writer for The Associated Press. After retiring from the AP, he returned to his hometown and got involved in community affairs, editorial consulting and research into Vallejo's colorful history.